Back in August I won a little Twitter competition from the lovely people at Bouffe. I won a light blonde version of their thickening spray. I had never heard of such a thing existing before Bouffe! Yes I knew about dry shampoos (my past discoveries are here) and I knew about the root boosting power of some of these dry shampoos and powders, but I didn’t realise there was a product that combined dry shampoo, volume and root coverage all in one pretty little can! Unbelievably that’s exactly what Bouffe does! It’s available in a shed load of different colours, including a silver version (clever!) and a one colour fits all. The light blonde worked really well on my heavily highlighted hair. I haven’t had my hair dyed or highlights done now for about six – eight weeks, and being pregnant for the bulk of that, my hair grew very quickly indeed. So yes I am sporting a two tone look, and some jolly lovely black roots! Bouffe totally covered my roots, to an unbelievable extent! I was more excited about this than any of the other benefits! I did give my roots a very liberal spraying once I discovered how good the colour coverage was, the downside to this is that I was left with a pretty sticky feeling barnet! My hair didn’t look anything other than clean, but it felt disgusting! When I came to washing it out, the shampoo suds were very yellow! So it did wash out very well (it also lasted in the rain without colour running down my face, so you need a thoroughly shampooing to get it out!). Because of the slightly sticky / heavy consistency styling volume into my hair was very easy indeed. You don’t really even need to back comb, just a little upside down shake, and a groom was enough to give my roots quite an intensive lift. If you’ve got fine hair this stuff is a dream! 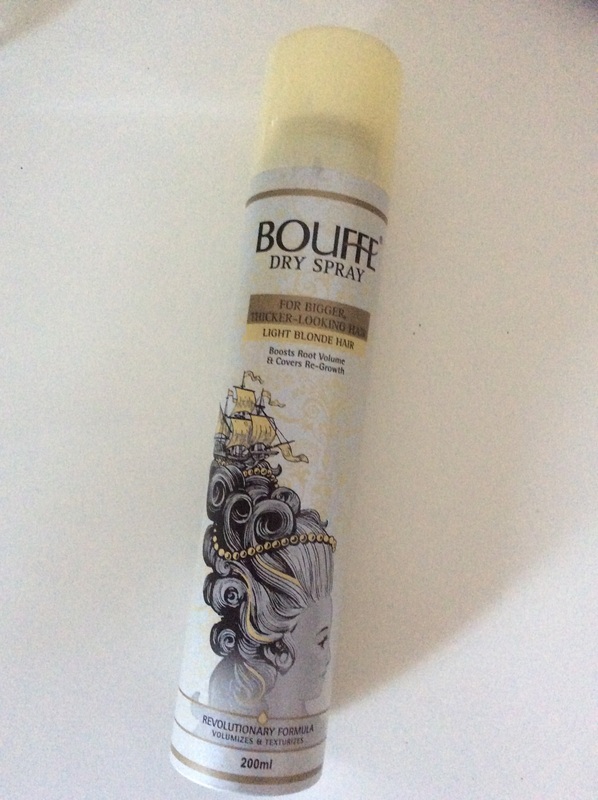 My hair is pretty normal at the moment, thanks to the old pregnancy hormones, previously I’ve had very fine hair, so I’m looking forward to using Bouffe when the hormones settle and my hair starts shedding again. Available from Boots for £5.99 for a big can! Loves – colour coverage is absolutely fantastic as is the root boosting power of this wonder spray! Not so Loves – Bouffe doesn’t feel great, it’s quite sticky, clumpy in texture. It’s fine for day three post washing, but I wouldn’t want to leave it on my hair for any longer than a day. Overall – fantastic for root coverage or for those of us that suffer with thin hair, I will buy a can when mine runs out!